JC-1 (5,5′,6,6′-Tetrachloro-1,1′,3,3′-tetraethylbenzimidazolylcarbocyanine chloride) is a mitochondrial dye that stains mitochondria in living cells in a membrane potential-dependent fashion.JC-1 monomer is in equilibrium with so-called J-aggregates, which are favored at higher dye concentration or higher mitochondrial membrane potential. JC-1 (5,5′,6,6′-Tetrachloro-1,1′,3,3′-tetraethylbenzimidazolylcarbocyanine chloride) is a mitochondrial dye that stains mitochondria in living cells in a membrane potential-dependent fashion.JC-1 monomer is in equilibrium with so-called J-aggregates, which are favored at higher dye concentration or higher mitochondrial membrane potential. The monomer JC-1 has green fluorescence (λ Em = 527 nm),while the J-aggregates have red fluorescence (λ Em = 590nm). Therefore, it is possible to use the fluorescence ratio technique to study mitochondrial membrane potentials. JC-1 is particularly useful for apoptosis studies. In apoptotic cells, the dye stays in the cytoplasm and fluoresces green. It has also been used in high throughput drug screening applications. JC-1, iodide (#70014) is the original salt form of the dye. 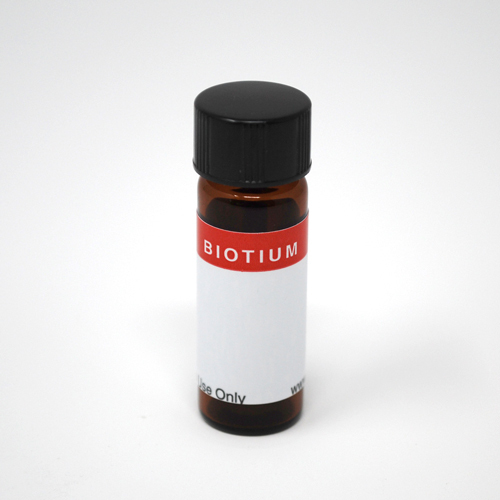 Biotium developed JC-1 chloride salt for applications where iodide ion is not desired. JC-1 chloride may also have the advantage of being slightly more water soluble than the iodide salt. 1. PNAS 88, 3671 (1991). 2. Biochemistry 30, 4480 (1991). Light-On LysoView™ 555 is a red fluorogenic lysosome dye with pH-dependent fluorescence. Light-On LysoView™ dye is unique among commercially available lysosomotropic dyes in that its fluorescence in cells is activated by exposure to UV excitation. Dihydrorhodamine 123 is the reduced form of rhodamine 123 (70010), which is a commonly used fluorescent mitochondrial dye.